Posted on October 6, 2011 by Susan H.
One of my favourite things about Fall is the start of apple season. Whether freshly picked, cooked for applesauce, baked in pies, cakes, muffins and even pressed for cider…apples are the bomb! Thanksgiving is fast approaching. I have plenty of Cortland apples picked from Watson’s Farm to bake and freeze some apple pies. Michael was ever so happy. Dairy, Egg, Soy and Peanut/Tree Nut Free Apple Pie is one of his most requested favourite desserts. I made 3 pies: froze 2 and baked one to sample. 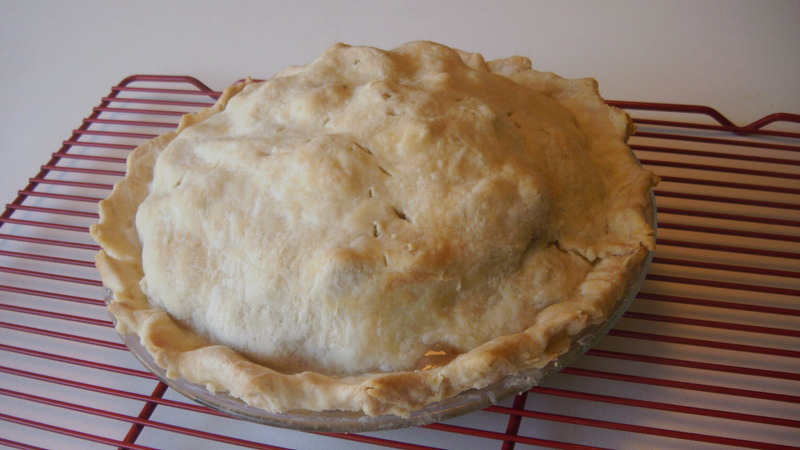 The key to a great pie: Cortland apples and a great flaky pastry. In 2008, my friend/neighbour, passed along her mother’s pastry recipe using canola oil. This is truly a winning recipe…my Mother-in-law approved. 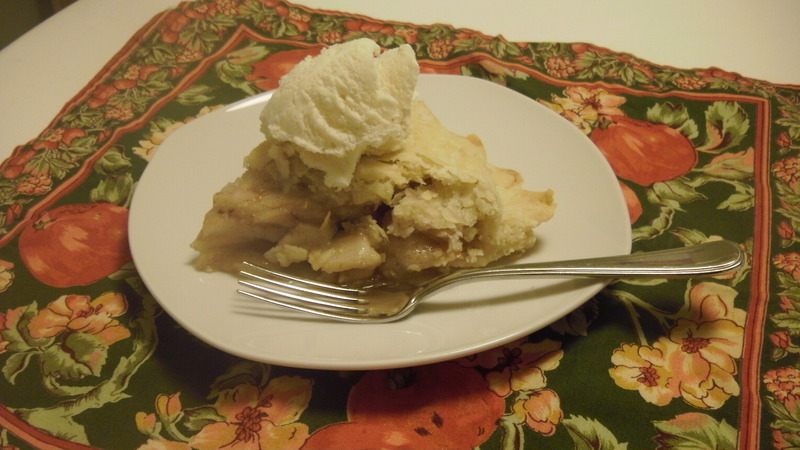 The recipe for the apple filling is adapted from Better Homes and Gardens New Cook Book. Peel and thinly slice apples into a large bowl. Add sugar, flour and cinnamon and stir to cover. In a medium bowl, mix flour and salt. In a liquid measure, mix together the oil and water. Make a hole in the middle of the dry ingredients and pour wet ingredients in hole. 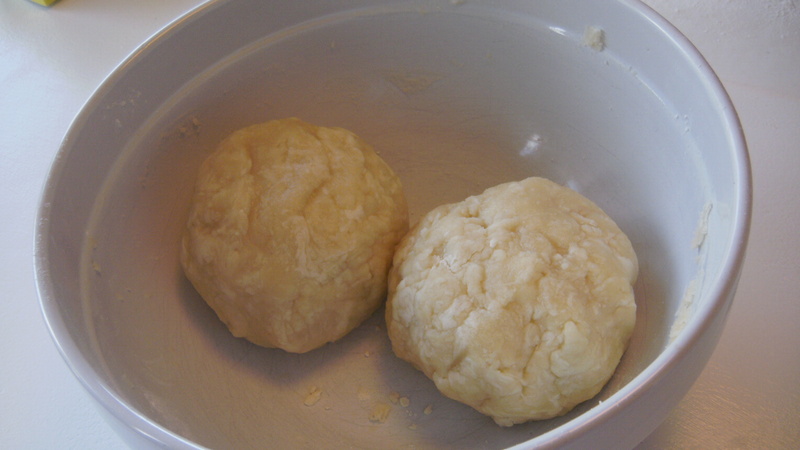 Form two balls with dough. Spread wax paper on a surface. Sprinkle generously with flour. Place ball of dough on wax paper and cover with another piece of wax paper. 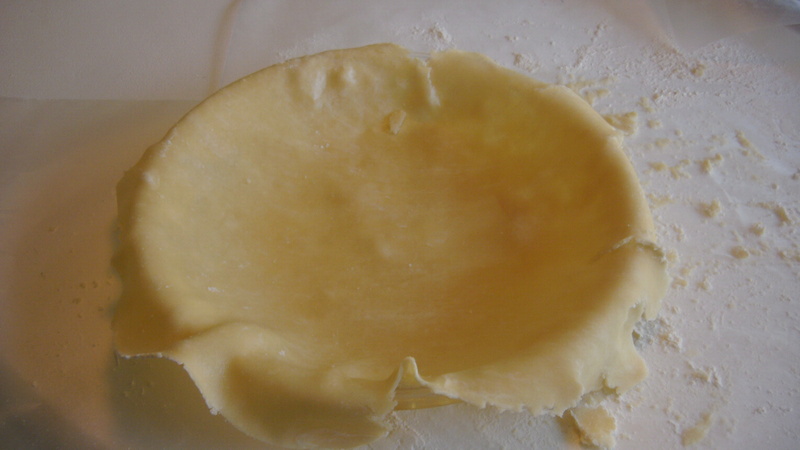 Using a rolling-pin, roll out the dough to fit glass pie plate. 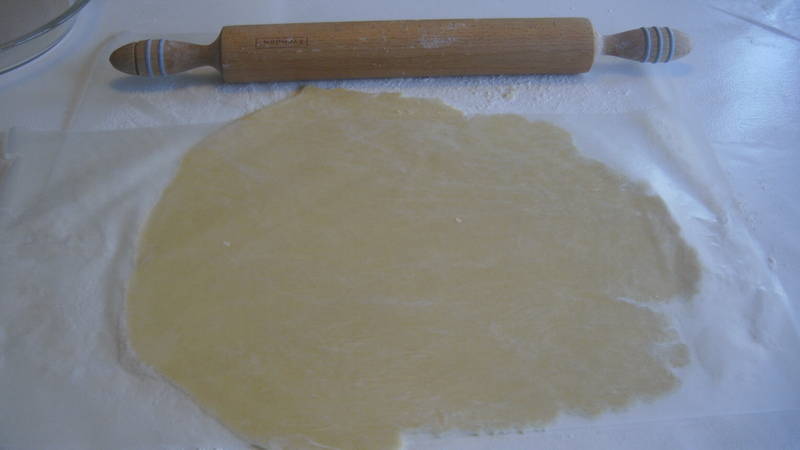 Carefully peel the top layer of wax paper off allowing the dough to stay on the top sheet. Carefully transfer the dough to the glass pie plate. Remember: Pastry dough is very easy to piece back together. Patch work the bottom layer of pastry dough to cover the pie plate if needed. Neatness is not required as it will still taste delicious. 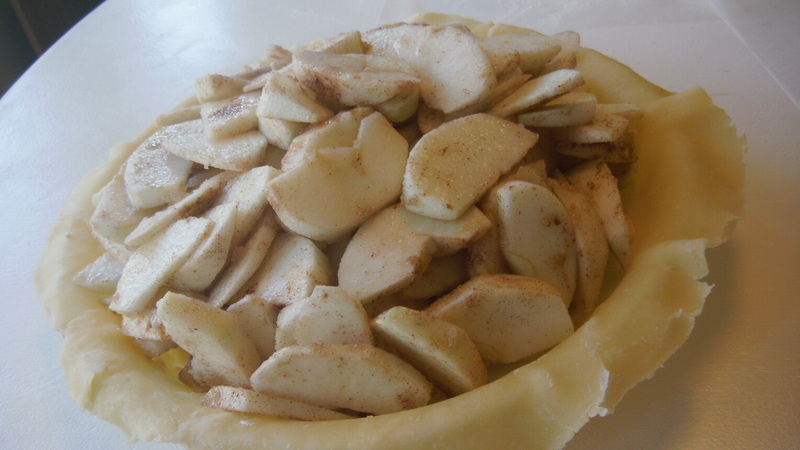 Fill pastry lined pie plate with apple filling. Sprinkle more flour over the bottom piece of wax paper and repeat rolling out the second ball of dough. Peel back top piece of wax paper, using fingers to help ease pastry dough along. Carefully transfer pastry dough to top the apple filling. Patchwork the pastry dough to cover the apple filling and pinch edges closed. Make a few slits in top of the dough. Bake at 375F for 50-60 minutes. If edges start to brown too quickly, cover with bits of foil. Let pie cool on cooling rack. 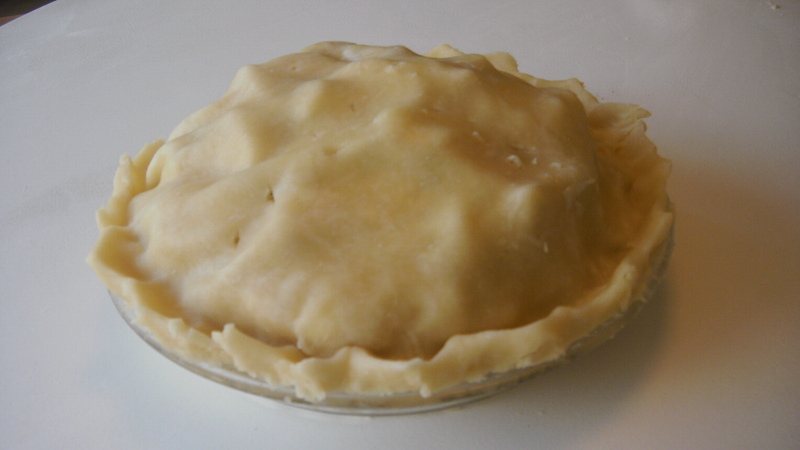 Tip: Freeze uncooked pies in an extra-large freezer bag. Bake from frozen the same as above. 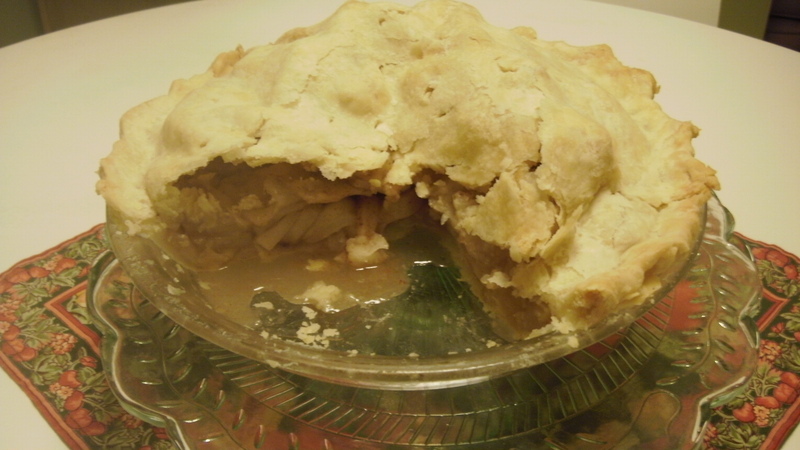 This entry was posted in baking, corn free, dairy free, dessert, egg free, peanut/tree nut free, pies, sesame free, soy free, thanksgiving and tagged canola oil based pie crust, dairy egg and soy free apple pie, dairy free apple pie, egg free apple pie, homemade cortland apple pie with canola oil crust, soy free apple pie by Susan H.. Bookmark the permalink. If you have any doubts at all about this pie I can tell you that the pie crust – you’d never know it was dairy free. So light and flaky! I speak as someone who has enjoyed a slice or two of this pie in my time. And even my picky nephews love it!